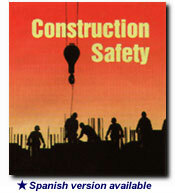 Extensive set of materials for construction safety training that works. Built with industry experts, this kit addresses the special needs of the construction industry. Help workers stay safe: with hazardous materials and electricity; when using tools and machinery; when behind the wheel; in confined spaces and in other specific situations. Improve general safety awareness and reduce accidents and injuries. Also available in Spanish or Bilingual versons! What Makes Hazardous Materials Hazardous? How Much Do You Know About Lockout/Tagout? How Much Do You Know About Confined Spaces? How Much Do You Know About Back Safety?